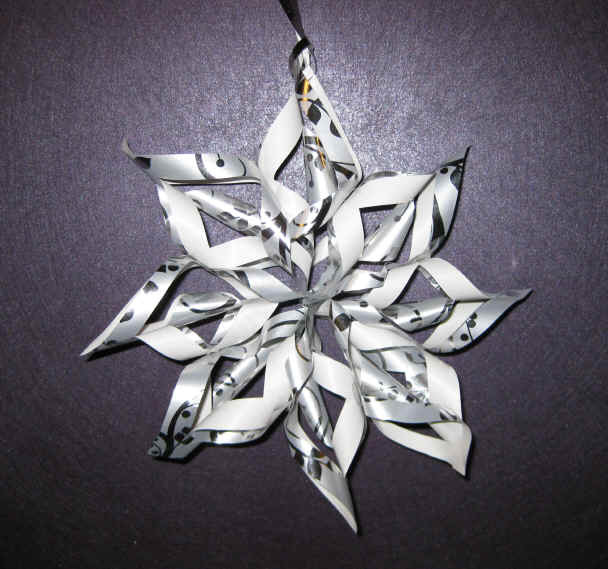 When I make these stars for people, they can't believe they are made from simple wrapping paper! These are very easy to make once you get the hang of it! 1. Cut 8 squares of paper all measuring the same size (I used 2.5 inch squares in the picture-which made a 6-inch star), but have made these with 5 inch squares also). 2. Fold each square in half (into a triangle) and then fold into a triangle again. 3. Cut the triangles one at a time as follows: Hold the triangle so that the long edge is on top and the 'closed' side is on the left. On the right side ('open' side) cut parallel to the long side about 1/3 down from the top, stopping around ¼ inch from the left side. Make another parallel cut about 1/3 down from the first cut, stopping around ¼ inch from the left side. 4. Open all the squares and you should see a center piece and 2 cuts that look like a "V". Bring the two inside points together and tape. 5. Turn the square over and tape the middle two points together. When taped, it should look 'rolled'. 6. Turn the square over again, and tape the outer two points together. 7. Now, tape all the squares together by taping the outer ring of one to the middle ring of the next. You should have all 8 in front of you, looking like a chain. 8. Tape the tips together (all 8) and then tape the first and last star together. Now you have your star! 9. Hang by using ribbon or whatever you'd like. Copyright © 2008 by Kristen Porter. All rights reserved.